Lighting has always been one of the fastest developing sectors in business, being directly influenced by cutting-edge technological innovation and advancement. To stay relevant in the industry, any serious lighting company needs to stay up to date with each market development, and have a willingness and flexibility to make necessary fundamental changes. While Commercial Lighting has maintained its position at the forefront of lighting technology since its foundation, the brand itself also needs to reassure clients that it continues to be the right choice for projects in 2016 and that it is comfortable adapting to whatever the future brings. To coincide with the company’s 25 years in Lighting anniversary, Commercial Lighting decided it was the perfect time to modernise its branding. After an examination of its current marketing strategy and how the brand was being presented to the market, it was agreed a more defined and consistent approach was needed, and in particular a more concerted effort with its social media platforms. Joining the company in March, my role has been to develop and implement a new brand identity, create a complete overhaul of the website to make it more intuitive and informative to viewers, and bring all digital material up to date with the new design. 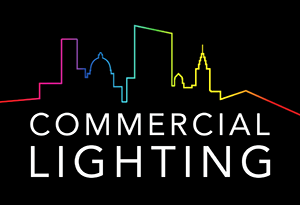 Commercial Lighting’s previous logo was created around 15 years ago, borrowing the eye-catching artwork originally commissioned from artist Becky Falstein for the front cover of their catalogue. While perfect for the front cover with its bright colours and bold abstract style, the artwork wasn’t specifically designed for the purposes of a logo, so it was decided a new specially designed logo could be more effective at representing the brand. Firstly, the original logo used the full company name (Commercial Lighting Systems Ltd), making it quite a mouthful, and also forcing a ratio of 7:1 to keep it legible at small sizes. This made it quite an awkward format for most applications. It was decided the shortened Commercial Lighting was identifiable enough and allowed for a more flexible design. While the original logo’s colours could be seen to represent ‘light’ I wanted to create something more literal, and the idea of a lit up skyline seemed the perfect solution. It allowed for the inclusion of silhouettes of real past projects, such as Syon Park, and the variety of buildings represented the range of projects Commercial Lighting caters for. The main strength and memorable feature of the original logo was its striking use of colour. I felt it important to maintain this in the new logo, and so incorporated the full colour spectrum in the skyline. Even with the completely new design, there is still a sense of familiarity from the original logo. While recreating the website to incorporate the new logo design and style and with a more contemporary aesthetic, I felt it important to also restructure the site. In the original version, there was little mention of all the ranges Commercial Lighting offers, with focus given solely to the company’s own Sovereign brand. Visitors can now find Brand Introduction pages, detailing the distinctions and strengths of each of the offerings and more information about their respective products. Similarly, there was very little information about the company itself in the original site. Being a well established small-scale company with a family atmosphere, it seemed advantageous to give more insight into the history and people behind the company. The new website has a substantial ‘about’ section, where visitors can get a real insight into the company’s make-up and values. We are now fully active on several social media platforms (Facebook, Twitter, Linkedin), so why not follow us as we continue to update our online presence and tell our story as we develop further.